The deadline for turkey permits is today, and it’s also my brother Darryl’s birthday. Happy birthday little brother. Michigans bird population has been on the upswing over the last several years, but could of hit a bump in the road this year due to heavy deep snow. We still have a couple months of winter to endure, and already were 5” over the “season” snowfall average. Here in Monroe county we set a snowfall record for January, and have at least 13-16 inches on the ground. These Michigan birds are hardy, but come nesting time, snow is not good. 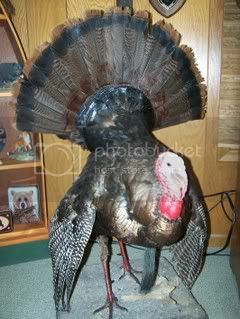 I think predation is on the rise also, as coyotes and foxes always injoy a turkey dinner Thanksgiving or not! It’s been a challanging year for hunting preditors, due to the deep constantly falling snows. Twice I made plans to try a coyote set-up and both times I encountered white-out conditions. This is also the first year I’ve ever needed snow shoes to manuver in the field. Anyway I put in for a guarunteed 234 permit which gives me the late hunt statewide. This may end up being a good decision, as the birds could be mating later than normal this year. I kind of like haveing the option to hunt statewide rather than be confined to any particular area. It is a little harder trying to call a Tom on the late hunt, but it can be done. Birthday boy Darryl has taken several nice birds during this period, and I’ve taken a few myself. If I can break away I might even try an Ohio hunt this year, we’ll see. 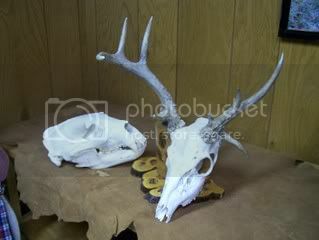 Finally my deer skull European mount is complete. It turned out pretty good, even if I do say so myself. The final stage consisted of letting the skull sit in a basin of peroxide and water. I actually let it sit for several days, and would periodically clean it with a soft brush and cloth. The teeth were the hardest part to get clean, but this part of the process, wasn’t bad at all. You need to remember to keep the horns above the peroxide line, unless you want everything white. I still haven’t made up my mind as to whether I’m going to mount it on a piece of wood or leave it “as is!” The bear skull in the picture is from my 19-6/16 inch Pope and Young bear skull. I used the “let the bugs do their work” bleaching process on that one. No messy skinning, meat removal, brain extraction, just bury it and let the insects do their job. It takes longer this way, but it probably is the best way to go. I have been having a ton of problems with my site here at “Blogs Monroe” and have been down for nearly two weeks. In my last post there should of been a picture of a soldiers wife sleeping by her husbands coffin. She requested that she be able to spend one last night with him, and the Marine honor guard tenderly and graciously granted her request. The picture is touching and powerful. You can probably surf the web and find it. I don’t know what happened to mine, but I hope my post problems are now solved. Thanks for being patient. You don’t have to say much about these pictures, they speak for themselves. You can hardly bear to ponder what the loved ones go through when confronted with the ultimate sacrifice. My heart breaks for this young wife, and for all the loved ones left behind. What a burden to bare! Unless you’ve experienced such emotion, one cannot comprehend the loss. I hope, we as a nation, can get it right, concerning our men and women serving in the armed forces. We “blew it” after Viet Nam, and the media darlings are at it again during this present conflict. A grass roots effort is underway to have all Americans, that support our troops, wear something blue this coming Friday, and each subsequent Friday, till our troops come home. It’s an idea to show solidarity and support, along with dignity and respect, for our brave men and women in uniform. Pass it along-wear blue on Fridays! 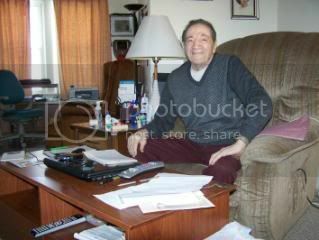 This is a picture of local legend Joe Giarmo. Joe has been around awhile (93 years) and he’s done and seen so many interesting things in his sojourn here. I’ve known Joe for over 40 years. We both worked at the local Ford plant as skilled tradesmen, but became good friends after Joe’s wife Dorthy passed away. 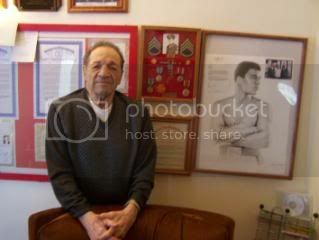 Joe was a boxer and boxing coach for over 60 years. He has trained 100’s of local boys the fine art of pugilism. His “boy'” have won many a golden glove title, regional honors, and state championships. Several even won national titles, and more than a few entered the professional ranks. Todd Riggs, who now coaches at “Joe’s Boxing Club,” was one of Joe’s students that fought professionally. Joe’s fighters trademark is the left hook. To this day Joe can throw a hay-maker of a left hook. I don’t know how many readers have been following this seasons “Contender” series on television, but Rico Hoye trained for awhile with Joe. The series has him being from Detroit, but he’s a local boy. I think he’s going to end up the runner up on the series. Also you will note the picture of Muhammad Ali behind Joe, along with numerous other declarations, awards, and honors. Monroe hosted a big celebration in Joe’s honor several years ago, and I contacted the Ali compound, in Berrian Springs Michigan. Joe had once been chosen as a trainer for the boxing Olympic tryouts in California. It just so happened that a brash young man named Cassius Clay was one of the fighters that Joe rubbed down, and got to know. Muhammad Ali remembered Joe and sent the signed picture along with a congratulatory letter. Joe has been learning how to use the computer, and right now he’s writing his memoiors. Trust me when I say his life would make a great movie. I stopped by to see him last week and took a picture of him on his P.C. at his “work station!” I’ll try and post that picture. Joe is one of a kind, and it’s my honor and prividledge to have him as a friend. Well I finally fired up the propane burner and heated the water to a boil. 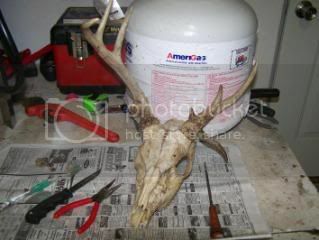 I added liquid laundry detergent to the water, and dropped the deer skull in. The soap helps break down the fat and grease, and also adds a much better aroma to the air than just meat, hair, and brains boiling. I had to do this in my garage cause I sure wasn’t going to venture outside. Art from “Simply Outdoors” said it might of been worth the $80 bucks to have a taxidermist do it, and at this juncture I’m inclined to agree with him! I boiled that skull for almost 4 hours, and ever 1/2 hour I removed it from the water to peel of everything but bone. The nose, eyes, and brain cavity were especially challanging. I boiled the bottom jaw, but removed it from the skull, as I don’t plan on using it as part of the mount. You can do it either way, but I prefer mounting just the upper part of the skull. I used needle-nose pliers, a knife, a hard bristle brush, and a home made tool for extracting brain matter. I’ve been around for a few Michigan winters (62) and I can not recall having so much snow so early. We’ve probably got 15-16 inches on the ground right now, and there is more in the forcast. Now I’m one of those guys, that don’t really mind the white stuff. In fact I love a freshly covered landscape all white and clean. How could an artist ever duplicate what a few inches of snow can do to ones environment, a forest, a mountain stream, or your own backyard? Yesterday I took a little walk, in the fluffy white stuff, and to my surprise didn’t see many animal tracks. I expected to find out where the rabbits were hiding, but my scearch turned up not one track. The squirrels are somewhat lighter, and they seem to traverse the snow just fine, but Mr. Cottontail either hunkers down in his burrow, or stays on the fringes of suburbia. I say that because even though I saw no rabbit tracks in the wild, there were some around my back deck and front bushes. The wrens, titmouse’s, and black capped chickadee’s visit the feeder all day long, as well as a couple cardinals. It must be near to impossible for our little feathered friends to make it through such a grueling winter without some help. 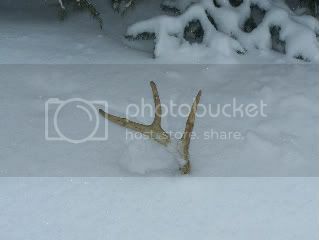 I wonder how the deer are faring, especially those in the Upper Peninsula, where snow depths are in the 5-7 foot range. 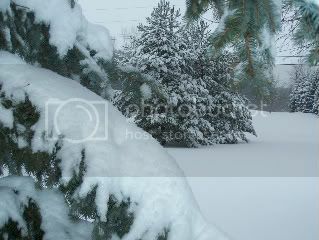 The hemlocks and cedars will sure take a hit, this year, in the winter yarding areas. It was good to get out for awhile, but I was ready for a hot chocolate when I got home. I stayed warm, but my face looked like a tomato, as I didn’t have a mask on. It made me thankful for my new furnace, hot water, and comfy home that’s for sure. For those with sqeemish stomachs, please turn your head. Oh it’s really not that bad! Hunters deal with this sort of biological reality all the time. 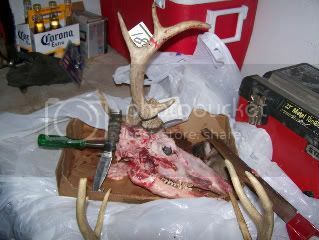 Recently my son-in-law had his deer (6-pointer) made into a European skull mount. The taxidermist, that did it, charged him $80.00! It looked real unique, but I wasn’t about to give that kind of money up, without a fight! I decided to do the mount myself, and as you see in the picture there is a little work involved. I had to skin the head out, saw of the neck, clean out the brain cavity, and remove the tongue and excess meat. I also removed the eyes from their socket, and this might of been the hardest part of the process. The lower jaw still needs to be removed, but I may just include that in the boiling of the skull. 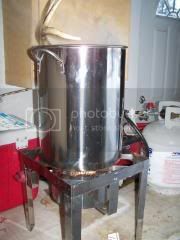 I have a propane burner and a large stainless steel pot for that particular step. It’s too cold today (high of +6) to work in my unheated garage, but in a few days it’s supposed to warm up. 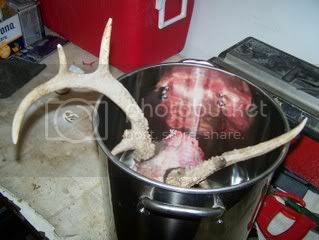 During the boiling process you need to make sure the antlers aren’t submerged in the water. Also you need to add some liquid laundry detergent to help remove the fat. About every 1/2 hour, remove the skull, let it cool somewhat, and remove everything that is loose from the skull. Also the skull can be scraped with a hard bristle brush during this time. Repeat this step until the skull is completely clean and ready for whitening. I don’t know how many of you hunters were out in the field those last few days of season, but several reported that the bucks were dropping their horns already. Three guys that I know, including one of my brothers, saw bucks with one side of their headgear missing. Seems kind of early to me, but I once shot a big buck around Thanksgiving that was bald. I had a doe permit, and I shot it as such! When I approached the downed deer I could see two large round areas, where the horns should of been. When I checked it into the D.N.R. they said he just dropped his horns earlier than normal. My brothers said only I could shoot a big buck with no horns! I took a walk today during the snowstorm around my house. My brother-in-laws have about 15 acres along a creek line, and it’s pretty good deer habitat. I used to have a stand set up next to the woods and creek, but barking dogs, close houses, and other hunters made me give it up. The shed in the picture was laying within 15 yards of where my old stand was. Deer do well in suburbia, and are masters at adapting to life in the “burbs!” I guess I’m going to have to rethink stand placement for next season. I looked for the other half of the shed, but the snow was getting way to deep. I’ll pursue it more come spring. If you want to see a bushel full of sheds check out Tom Sorenson’s find at “Base Camp Legends” in the video section. Tom and his brother Gary found some really nice sheds while on one of their last hunts of the year. 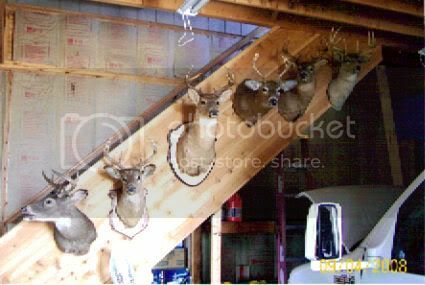 What you see in this picture is 6 respectable Michigan bucks. Actually four of them are pretty darn good bucks, and what most of us hunters would love to put our tag on someday. The biggest buck in this group has a Boone and Crockett score of around 130 points. Most guys that I know could care less about what a buck officially scores, but when a deer’s rack starts drawing alot of public attention size does matter. Truly large once in a lifetime bucks bring the lucky hunter fame, notoriety, and sometimes money. World class bucks could mean tens of thousands of dollars, and world record bucks can fetch upwards to seven figures by way of endorsements, reproductions, and public appearances. Some states like Iowa, Kansas, Nebraska, Ohio, Indiana, and even Missouri are well known for their monster whitetails. Deer hunting outfitters, for a few thousand dollars, will guide their clients in a quest to down “The big one!” You don’t always have to have a guide as several Michigan hunters can testify. Michigan has more licensed hunters than any other state, and has a long heritage concerning the outdoors and sportsmen. We are not know as a hunting destination when it comes to “big bucks!” If this season is any indication that could be changing in the future. At least six deer were taken this season that fall in that “world class category,” and are an impressive display of what Michigan has roaming it’s forest. Bill Rushford took a Upper Peninsula buck that scored 192-5/8. Chris Hiltunan tagged a 16 pointer that scored 187-3/8 in Washtenaw county. Several other deer in the 165-180 range were taken this season, with a couple of them coming from public land. Let’s not forget Bob Reits monster 19 pointer from last year that scored 205-5/8 (new archery state record) and Tom Brittenfields 2007 muzzleloader giant that nets 190-6/8. 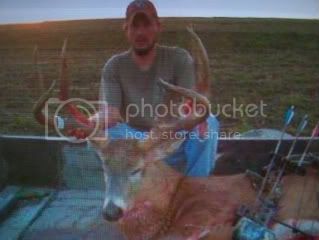 (new state muzzleloader record) These are impressive deer coming from a state that is hunted to the max. That’s good news, and could even get better, now that a statewide ban on baiting is in effect.